Thunderfoils are quite possibly the world's most awesome sport kite. They are portable and easy to fly, with no assembly required and no parts to break. You get a tremendous rush of adrenaline the first time you are pulled off balance and fall forward flying a power kite. Thunderfoil™ IIs provide lots of traction for their size and their compact, easy to stow pouches mean you never have to leave home without them. Thanks to their solid pull and big kite feel, Thunderfoil™ IIs make excellent trainer kites for those seeking to learn the skills required for kite boarding. 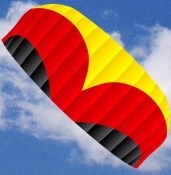 This kite features scalloped wings with 16 cells, more than other dual line foils of this size, to provide a stiffer, more efficient profile that is fast and tight turning. Improved bridling and cross vented cells provide collapse resistance on the edges of the wind and amazing relaunch capabilities after a nose dive.